Have you ever wondered, after reading a ridiculously elaborate description in, say, Wine Spectator, how can wine possibly smell like tobacco?…or coffee, green pepper, orange blossom, eucalyptus, or licorice? And why would you want to drink it if it actually smelled like kerosene, burnt matches, garlic…or tar – or even, no I am not kidding, cat pee? And isn’t it ironic or incorrect that we say “wine tasting” but spend most of our effort to describe how wine smells? Well, wine tasting is not rocket science. And it’s not solely the province of snobby, self-appointed experts with million-dollar cellars…you can do it, too. Learning to appreciate wine does take a little bit of knowledge, a lot of patience, some effort, and some time. And some money, but not as much as you might think. Of course, you can spend a lot of money on tasting “aids” such as Le Nez du Vin, the creation of an enterprising Frenchman. 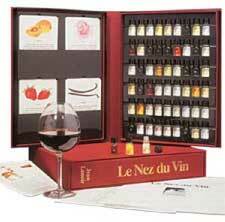 This rather expensive kit ($400-500) is actually a lot of fun, and can help people who are new to wine tasting, learn to discern basis aromas. I have the red wine-only version that set me back 100 bucks, and my friends enjoy when I break it out. Kids really like it, too. But these are a a luxury and not necessary. To help you figure out and record what you’re tasting, download and print the Wine-Flair Tasting Notes page! Anyway, white wines can range from almost transparent to pale green, straw yellow, gold, yellow-brown, to almost brown for very old vintages. But most whites run in a narrower band starting from almost colorless, for things like Soave, or Vinho Verde, to very young Chablis, to Rieslings, and White Bordeaux and other Sauvignon Blanc-based wines with the color of straw. When you get to California Chardonnays they begin to take on a golden hue, and then you’re moving on to deep gold like Viognier and Semillon and dessert wines. Very old whites, or spoiled ones, can also take on a dark color, tending towards the tint of tea. Reds start with a cherry color for Gamay-based wines like Beaujolais, Pinot-Noir based wines or Cabernet Franc wines like Chinon. But other than these, many wines are a purple to deep purple color in their youth and so this doesn’t tell you much; you’ll have to rely on aroma, flavor, the shape of the bottle and a peek at the label. Many other reds will be a medium-red, a kind of crimson, and this doesn’t tell you much, either. Of course, wines made from Cabernet Sauvignon or Nebbiolo, which have a lot of pigment in their skins, hold their deep purplish color for decades. All red wines that have have begun to age take on a reddish-brick color, and oxidized wines are brick-brown or just plain brown in color. In July of 2005 at the Rudd Wine school of the Culinary Institute of America in St. Helena, CA, we opened a 26 year old Cabernet. It was already brick-red but still drinkable, although within a couple hours and fully exposed to oxygen it was undrinkable and had turned brown before our eyes. Rose wines can be the palest pink, to deep pink and even orange. Thus, color can give you some indication of age, but it can also indicate the main grape variety in the wine. You’ll get better at this the more you do it. Or you may not care. But it can be fun. Wine can range from brilliantly clear to clear, slightly cloudy, cloudy and finally dull. But unless it’s from an old vintage or it was recently jostled or carelessly opened, you’ll rarely find a truly cloudy wine. However, wines made from grapes grown in very warm climates can be less than brilliantly clear, especially if they’re not fined or filtered. To “fine” means to clarify new wine just before bottling, by adding one of several fining agents such as egg whites or Bentonite (yes, it’s dirt) or something called isinglass (a kind of collagen, made from sturgeon bladders). But don’t worry, you won’t taste any of these – they are removed from the wine. Making wine can be like sausage, you know. Filtering, on the other hand, involves passing the wine under pressure through a membrane or other system that removes undesirable microbes or particles that can lead to spoilage or simply to a wine that’s not brilliantly clear. Of course, many winemakers believe that aggressive filtration can also remove important elements that give wine distinctive flavors and the ability to age gracefully. In whites that have not been cold stabilized – a process just before bottling that removes crystals of Tartrate – you may see these crystals at the bottom of the bottle, resembling tiny shards of glass. 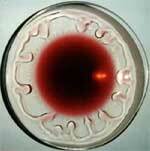 They’re less visible in red wines as they take on red pigment. In any case, they’re not harmful and a natural product of winemaking. On occasion, wine can be cloudy if fermentation has begun again in the bottle (this is an error in winemaking) or if it is spoiled. This is rare. The aroma is the smell of the wine that comes from the particular grape variety. Now, wine aficionados often distinguish between aroma and bouquet, the additional smells that are created by the process of fermentation, and over time as wine ages in the bottle. These smells are usually collectively referred to as the wine’s “nose.” They are distinctions that may be important to professional wine tasters, writers and people in the wine trade, but for you and me they are mostly academic, I think. Still, it’s good to know what the terms mean. There are dozens of “accepted” aromas on the Wine Essence Wheel (copyright 1990, 2002 A. C. Noble) categorized under fruity, herbaceous, nutty, caramel, woody, earthy, chemical, pungent, oxidized, microbiological, floral and spicy. These are the terms that wine tasters use to describe what they smell, and are a result of the volatility (tendency to evaporate) of the components of wine such as alcohol, esters, etc. The essence Wheel was created by Ann Noble, of the University of California at Davis, and you can find them at a lot of wine stores for about 10 bucks or less, or directly from The Wine Aroma Wheel Web Portal. They’re pretty handy for helping you recognize what you already know, and just apply that to the wine you’re smelling. I would get one (I have a couple myself). Body is how you describe the heaviness or “mouth-feel” of the wine, and it’s the result of two things – alcohol content, and extracts. The alcohol level can vary widely, from, say, as low as 8-9% for some German and Alsatian Rieslings, maybe some Beaujolais, or the Portuguese Vinho Verde. At the high end you’ll find 15+% for some so-called “monster” California Cabs, or perhaps a Grenache-based Chateauneuf du Pape. Generally, more alcohol, more body (though not always), and wines that are high in alcohol can leave a hot sensation in your mouth. Extracts are solids dissolved in the wine – glycerol, sugar, pigment, tannins, and other stuff – and obviously these contribute to body. Residual sugar in wine is a big factor; very sweet wines can be viscous to the point that you’d describe them as thick, especially white dessert wines such as Sauternes and Tokay. Many, but not all whites are light to medium-bodied, and reds tend to be medium to full-bodied. Yet there are plenty of exceptions – for example, Viognier is often a full-bodied, even viscous white wine. When you swirl and see the “legs” run down the inside of your glass, that’s one way to determine the body of a wine. But contrary to popular wisdom, the legs don’t tell you anything about quality, just alcohol content. Higher levels of alcohol increase viscosity and therefore give a sense of weightiness. And, alcohol, since it’s really a flavor-delivery system, can also boost the perceived sweetness of wine. Tannin is not a taste, but rather a discernible drying, astringent sensation that you’ll feel mostly along your gum line when drinking reds, particularly young ones and those based on the Cabernet Sauvignon grape. But there are other grapes such as the Tannat that are even more tannic. Many tasters often liken tannin in wine to a similar sensation in very strong teas. You can describe tannin as harsh, chewy, soft or supple. Over time, some tannins can soften in the bottle and others can attach to each other to become more noticeable and astringent. 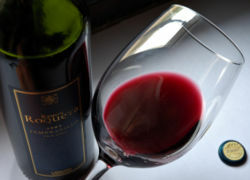 Tannin provides structure for red wines and help preserves them, sometimes for decades or more. But a lot of conventional wisdom about tannins has recently been challenged by some studies; for example, some Pinot Noirs have more tannin than some Cabernets. See the Wine Glossary for more info. This is the one you are certainly most familiar with…you do this dozens of times each day. Flavor describes how wine tastes apart from its aromas, and can include the basic tastes of sweetness, sourness, bitterness and saltiness. A fifth essence that many wine tasters can perceive is umami, the protein-based flavor of savoriness or meatiness. Sweetness is also an important element, ranging from cloying to very sweet, sweet, semi-sweet, off-dry and dry. Perceiving sweetness can be tricky; some wines that are perceived to have some residual sweetness are actually fooling your palate with a big dose of fruit. Others that you perceive to be dry may actually be off-dry, but have an added dose of acid that masks the residual sugar. Acidity in wine is really important, and there are a lot of acids in wine. But don’t worry about figuring out what they are. Instead, think about if, and how, the acid in the wine you’re tasting helps create balance, providing an overall sense of symmetry that is pleasing to your palate. We use a lot of words to describe acidity, starting with tart or “green” (too much). Wines that have notable but not excessive acid are often called crisp or brisk. Less but still noticeable acid is sometimes called bright or fresh. Finally, wines that don’t have enough acid are termed flat or flabby. Acid is important because it refreshes the palate and keeps the wine, well, “interesting” to our taste buds. Just like Coca-Cola that’s been opened for a few days, wine that lacks acid tastes flat and you’ll tire of drinking it very quickly. A two-dimensional measure: How the wine tastes just as you swallow it, and how long those flavors of the wine linger on your taste buds and in your mouth. Or it can mean a person from Finland.